Module 2: Designing With Text has presented me with challenges I had not expected to face in this class. First and foremost, it has been a very long time since I have used Microsoft Word to do anything truly creative. However, the reasoning for this is that Word is not a good software program for supporting graphics. Since we cannot work with graphics in this unit, the creative challenges I face are more about my mastery of the program than about the program itself. I completed a draft of my module two project before doing the assigned readings for this week. After having done the readings, I plan to create a second draft before our rough draft is due. The ideas I was able to draw from the three Blackboard readings were very helpful. In particular, I will do more work with kerning and line spacing. 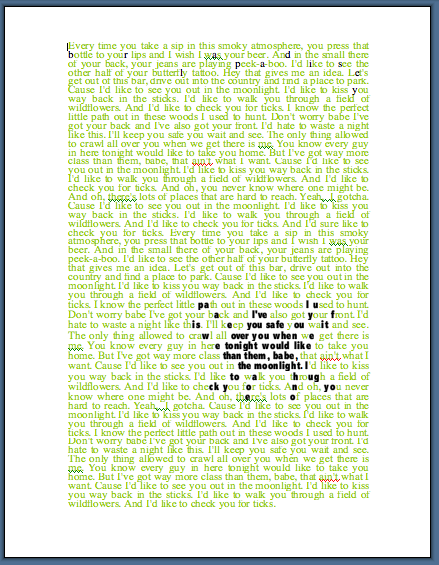 Originally, I chose to work with the lyrics from the Brad Paisley song “Ticks.” I placed the lyrics, repeated to fill the page, into a document and turned them green to reference a field that makes an appearance in the lyrics. I then turned select bits of text black, trying to form the shape of a tick. This proved more difficult than I had imagined. The tick just did not show up very well. I bolded the letters, which helped a little. But, having read the assigned readings (especially the one from the Non-Designer’s Type Book), I know I can do a number of things to make that text stand out more. My tick is basically functioning as a serif — his little legs are getting lost like the feet on a serif typeface when used as a headline. Mostly, the image needs to appear more dense, and I now have a number of tools at my disposal to make that happen. (I also think peer review will be a great help in this project.) I have a feeling this is project I could tinker with forever and not be entirely satisfied. Typography, clearly, is an addiction!